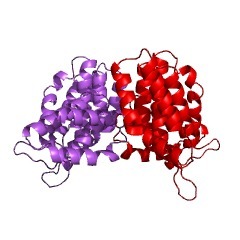 MIF4G stands for middle domain of eukaryotic initiation factor 4G (eIF4G). 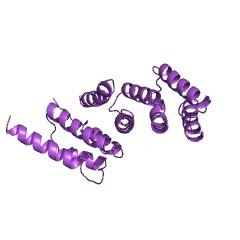 eIF4G is a component of the translation initiation factor eIF4F complex and the cytoplasmic cap-binding protein complex (CBC). 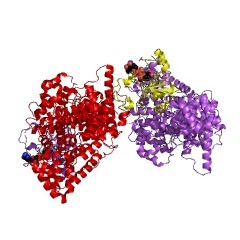 In the cytoplasm, cap binding complexes, distinct in their composition from nuclear cap-binding complexes, have important roles in the initiation of mRNA translation. 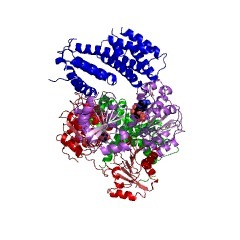 The MIF4G domain also occurs in other proteins, including CBP80, a component of the nuclear CBC and NMD2, involved in the cytoplasmic nonsense-mediated mRNA decay. 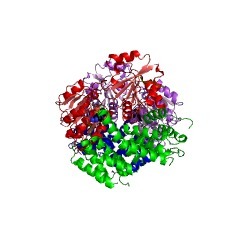 The domain is rich in alpha-helices and may contain multiple alpha-helical repeats. In eIF4G, this domain binds to the two other components of the eIF4F complex, eIF4A and eIF3E, and to RNA and DNA [(PUBMED:10973054)]. There are 13738 MIF4G domains in 11270 proteins in SMART's nrdb database. Taxonomic distribution of proteins containing MIF4G domain. This tree includes only several representative species. The complete taxonomic breakdown of all proteins with MIF4G domain is also avaliable. Click on the protein counts, or double click on taxonomic names to display all proteins containing MIF4G domain in the selected taxonomic class. Identification of a nucleic acid binding domain in eukaryotic initiation factor eIFiso4G from wheat. Higher plants have two complexes that bind the m7G-cap structure of mRNA and mediate interactions between mRNA and ribosomal subunits, designated eIF4F and eIFiso4F. 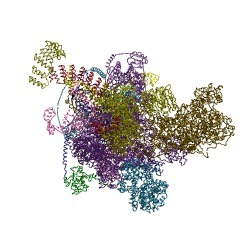 Both complexes contain a small subunit that binds the 5'-cap structure of mRNA, and a large subunit, eIF4G or eIFiso4G, that binds other translation factors and RNA. 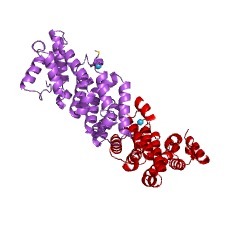 Sequence-specific proteases were used to cleave native cap-binding complexes into structural domains, which were purified by affinity chromatography. 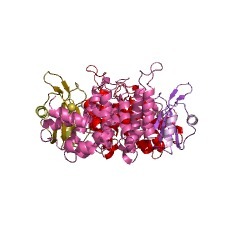 We show here that eIFiso4G contains a central protease-resistant domain that binds specifically to nucleic acids. 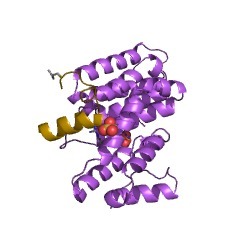 This domain spans Gln170 to Glu443 and includes four of the six homology blocks shared by eIFiso4G and eIF4G. A slightly shorter overlapping sequence, from Gly202 to Lys445, had no nucleic acid binding activity, indicating that the N-terminal end of the nucleic acid binding site lies within Gln170 to Arg201. The binding of the central domain and native eIFiso4F to RNA homopolymers and double- and single-stranded DNAs was studied. Both molecules had highest affinity for poly(G) and recognized single- and double-stranded sequences. Eukaryotic translation initiation factor 4AIII (eIF4AIII) is functionally distinct from eIF4AI and eIF4AII. 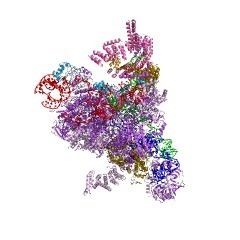 Eukaryotic initiation factor 4A (eIF4A) is an RNA-dependent ATPase and ATP-dependent RNA helicase that is thought to melt the 5' proximal secondary structure of eukaryotic mRNAs to facilitate attachment of the 40S ribosomal subunit. 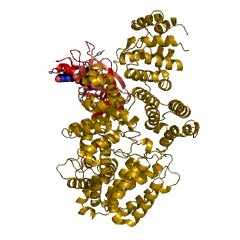 eIF4A functions in a complex termed eIF4F with two other initiation factors (eIF4E and eIF4G). Two isoforms of eIF4A, eIF4AI and eIF4AII, which are encoded by two different genes, are functionally indistinguishable. A third member of the eIF4A family, eIF4AIII, whose human homolog exhibits 65% amino acid identity to human eIF4AI, has also been cloned from Xenopus and tobacco, but its function in translation has not been characterized. In this study, human eIF4AIII was characterized biochemically. While eIF4AIII, like eIF4AI, exhibits RNA-dependent ATPase activity and ATP-dependent RNA helicase activity, it fails to substitute for eIF4AI in an in vitro-reconstituted 40S ribosome binding assay. Instead, eIF4AIII inhibits translation in a reticulocyte lysate system. In addition, whereas eIF4AI binds independently to the middle and carboxy-terminal fragments of eIF4G, eIF4AIII binds to the middle fragment only. These functional differences between eIF4AI and eIF4AIII suggest that eIF4AIII might play an inhibitory role in translation under physiological conditions. 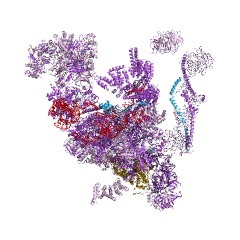 In the initiation of translation in eukaryotes, binding of the small ribosomal subunit to the messenger RNA results from recognition of the 5' cap structure (m7GpppX) of the mRNA by the cap-binding complex eIF4F. 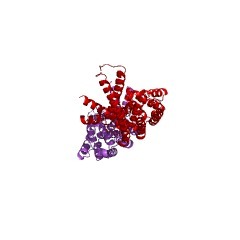 eIF4F is itself a three-subunit complex comprising the cap-binding protein eIF4E, eIF4A, an ATP-dependent RNA helicase, and eIF4G, which interacts with both eIF4A and eIF4E and enhances cap binding by eIF4E. The mRNA 3' polyadenylate tail and the associated poly(A)-binding protein (PABP) also regulate translational initiation, probably by interacting with the 5' end of the mRNA. In yeast and plants, PABP interacts with eIF4G but no such interaction has been reported in mammalian cells. Here, we describe a new human PABP-interacting protein, PAIP-I, whose sequence is similar to the central portion of eIF4G and which interacts with eIF4A. Overexpression of PAIP-1 in COS-7 cells stimulates translation, perhaps by providing a physical link between the mRNA termini. Translation initiation in eukaryotes is facilitated by the cap structure, m7GpppN (where N is any nucleotide). 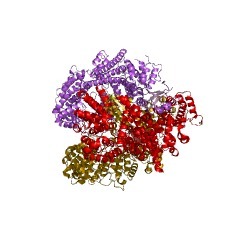 Eukaryotic translation initiation factor 4F (eIF4F) is a cap binding protein complex that consists of three subunits: eIF4A, eIF4E and eIF4G. eIF4G interacts directly with eIF4E and eIF4A. 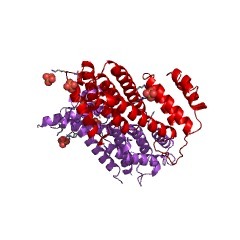 The binding site of eIF4E resides in the N-terminal third of eIF4G, while eIF4A and eIF3 binding sites are present in the C-terminal two-thirds. Here, we describe a new eukaryotic translational regulator (hereafter called p97) which exhibits 28% identity to the C-terminal two-thirds of eIF4G. p97 mRNA has no initiator AUG and translation starts exclusively at a GUG codon. 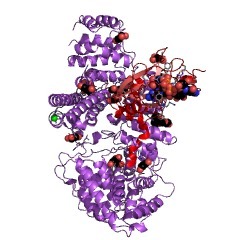 The GUG-initiated open reading frame (907 amino acids) has no canonical eIF4E binding site. 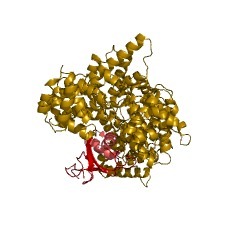 p97 binds to eIF4A and eIF3, but not to eIF4E. Transient transfection experiments show that p97 suppresses both cap-dependent and independent translation, while eIF4G supports both translation pathways. Furthermore, inducible expression of p97 reduces overall protein synthesis. These results suggest that p97 functions as a general repressor of translation by forming translationally inactive complexes that include eIF4A and eIF3, but exclude eIF4E. Functional dissection of eukaryotic initiation factor 4F: the 4A subunit and the central domain of the 4G subunit are sufficient to mediate internal entry of 43S preinitiation complexes. 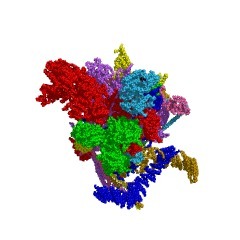 Eukaryotic translation is initiated following binding of ribosomes either to the capped 5' end of an mRNA or to an internal ribosomal entry site (IRES) within its 5' nontranslated region. 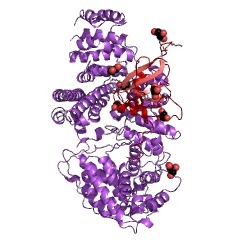 These processes are both mediated by eukaryotic initiation factor 4F (eIF4F), which consists of eIF4A (helicase), eIF4E (cap-binding protein), and eIF4G subunits. Here we present a functional analysis of eIF4F which defines the subunits and subunit domains necessary for its function in initiation mediated by the prototypical IRES element of encephalomyocarditis virus. In an initiation reaction reconstituted in vitro from purified translation components and lacking eIF4A and -4F, IRES-mediated initiation did not require the cap-binding protein eIF4E but was absolutely dependent on eIF4A and the central third of eIF4G. 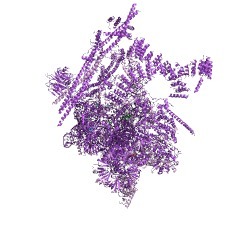 This central domain of eIF4G bound strongly and specifically to a structural element within the encephalomyocarditis virus IRES upstream of the initiation codon in an ATP-independent manner and with the same specificity as eIF4F. The carboxy-terminal third of eIF4G did not bind to the IRES. The central domain of eIF4G was itself UV cross-linked to the IRES and strongly stimulated UV cross-linking of eIF4A to the IRES in conjunction with either eIF4B or with the carboxy-terminal third of eIF4G. Cap-dependent binding of mRNA to the 40 S ribosomal subunit during translational initiation requires the association of eukaryotic initiation factor 4G (eIF4G; formerly eIF-4 gamma and p220) with other initiation factors, notably eIF4E, eIF4A, and eIF3. Infection of cells by picornaviruses results in proteolytic cleavage of eIF4G and generation of a cap-independent translational state. Rhinovirus 2A protease and foot-and-mouth-disease virus L protease were used to analyze the association of eIF4G with eIF4A, eIF4E, and eIF3. 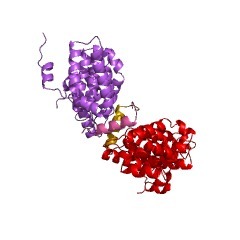 Both proteases bisect eIF4G into N- and C-terminal fragments termed cpN and cpC. cpN was shown to contain the eIF4E-binding site, as judged by retention on m7GTP-Sepharose, whereas cpC was bound to eIF3 and eIF4A, based on ultracentrifugal co-sedimentation. 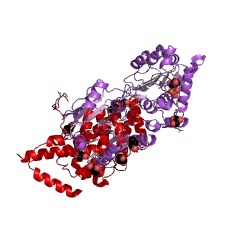 Further proteolysis of cpN by L protease produced an 18-kDa polypeptide termed cpN2 which retained eIF4E binding activity and corresponded to amino acid residues 319-479 of rabbit eIF4G. 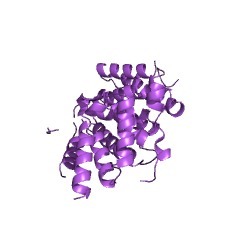 Further proteolysis of cpC yielded several smaller fragments. 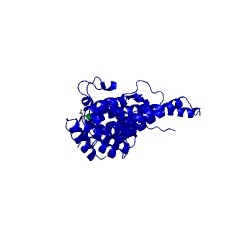 cpC2 (approximately 887-1402) contained the eIF4A binding site, whereas cpC3 (approximately 480-886) contained the eIF3 binding site. 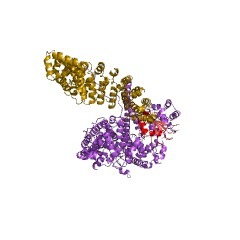 These results suggest that cleavage by picornaviral proteases at residues 479-486 separates eIF4G into two domains, one required for recruiting capped mRNAs and one for attaching mRNA to the ribosome and directing helicase activity. Only the latter would appear to be necessary for internal initiation of picornaviral RNAs.